In 1994, Christian von Koenigsegg was a man on a mission! He was a Swedish tycoon - and he had decided to build the fastest road car the world had ever seen! F1-derived technology would help - so it was duly factored in. In 2000 - six years after von Koenigsegg first conceived the project - the carbon-fibre-skinned fruit of his labours appeared. The prototype - unveiled at the Geneva Motor Show - became the Koenigsegg CC 8S. That went on sale in 2002. In 2004, came the CCR. At the Nardo test track - in Italy - it was officially clocked at 241.63mph. Which made it the fastest production car in the world. Von Koenigsegg had delivered! His tiny outfit had cocked a snook at some of the biggest automotive players ... like the mighty McLaren, for example. 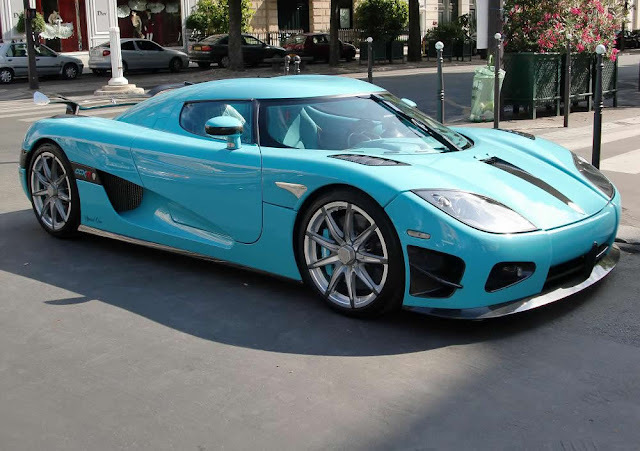 If the CCR was the stuff of fantasies, the Koenigsegg CCX introduced some real-world charm. While it was way out of reach of the average buyer, it did, at least, seek to address everyday issues. Air pollution, for one. US safety and emissions regulations are nothing, if not stringent! But, von Koenigsegg's cars would meet them head-on! Key to that was a squeaky-clean engine. Koenigsegg HQ is in Ängelholm, Sweden - and it was there that an environmentally-friendly V8 was developed. Specialised heat treatment reduced the amount of aluminium needed. Two centrifugal superchargers were fitted. The result was a staggering 806bhp - from just 6,900rpm! Dry-sump lubrication let the engine's centre of mass be lowered - aiding handling. The gearbox was six-speed. As for gear ratios - buyers could select from a range of driving-style options! Bodywork-wise, the CCX was equally-well-sorted. It was made from carbon-fibre and kevlar. The CCX's aerodynamics were meticulously crafted. The car's underside was flat - save for venturis cut into the rear. An optional rear spoiler only added to the downforce. And yet - for such a state-of-the-art supercar - the CCX was eminently manageable. Its doors were 'dihedral synchro-helix' ... meaning that they rotated forwards and up, of course. Nice and convenient! And - on a sunny day - the car's targa top could be detached, and stowed beneath the bonnet. Though that might not have been the best time to test the 259mph top speed available. 0-60 came up in a very convenient 3.2s! The Koenigsegg CCX, then, fused supercar performance with practicality. Which was, no doubt, all exceedingly pleasant ... if you could afford to find out!